Home > 12 Packs Of Lobsters! 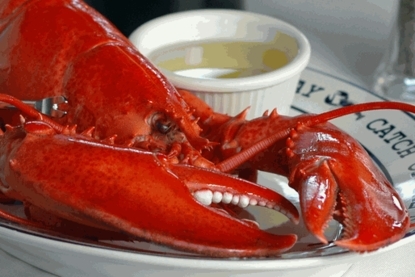 > Land O' Lakes Butter > Fresh Lobsters! > All Size & Individual Lobsters On Sale! > 2 to 2 1/2 pound Live Maine Lobsters! These 2-2 1/2 pound Live Maine Lobsters are the starting size of the Select size Lobsters, and are one of the most popular sizes we offer! One of our most popular size Maine Lobsters and a plate filler! You're going to be full after dining on one of these, so get The Butter ready! Note: Price is per Lobster. (Minimum of Two) Please enter quantity upon checkout! John ordered live Maine lobster for my birthday from The Lobsterguy.com so excited! Much better than eating dinner out! Our 8 lobsters (2 -2 1/2 pounds) were out of this world! This is our second experience with you all, and it is unbelievably wonderful! fact, daughter wants them for Thanksgiving! ;) Keep up the great trolling. The lobsters I ordered arrived in Florida on the exact day, in excellent condition and were totally delicious. They even included an anniversary card since I had indicated on my order that the lobsters were to celebrate our 50th wedding anniversary. I would not hesitate to recommend this vendor to anyone!